I don’t think I have ever actually broached this subject before. Yeah, that makes it sound like I might touch on something profound or something but really it isn’t that out there. It’s been a while since a Dresden book has come out. I’m referring to Harry Dresden, the professional wizard stories written by Jim Butcher. If you have never read them, picture a bit of noir but instead of a hard-boiled detective you have a crusty wizard, down on his luck. Actually, some of my favorite stories. I was one of those weirdos that came first into contact with the character through the short-lived TV show that was so far removed from what the stories actually are, they are two separate entities. I still like the show but take it with a grain of salt. You can’t expect Dresden in it if you know the books. But something has to be said for a wizard that uses a hockey stick as his wizarding staff (yeah, so not the book). See, instead of getting the next novel in the series, we have been given a short story collection. This is one that collects a bunch of the Dresden stories that have appeared in other collections (and one that is brand new). I have a tendency when I read the stories to spend more time simply enjoying them. I don’t often have the gumption to dig through and make outside connections. But so far, out of the stories that make up this collection, I have run across one that followed such an odd pattern, the way it played out is still digging into my brain. The majority of the Dresden stuff is written in first person. Doesn’t matter if it is Harry, or someone else taking the lead, we still see the world through the main character’s eyes for the story. I say this because there happened to be a story I read early on in the book, where Harry wasn’t even born yet. We experience it through an entirely different character, and still first-person narration. Mind you, not where I was going with this but an interesting distinction to connect with. No, I am thinking of the story AAAA Wizardry. Without going into the whole line of details about the timing of this story within the greater timeline, we will just focus on the idea that Harry is training some new recruits. The greater details of the timeline and such aren’t as important here, because I would rather just say read the books and see what is going on. Instead, I am more interested in the mechanics of how the story is laid out. See, it is all still in first person, but we have essentially two different stories happening at the same time. One is the lecture to the trainees and the other is a case that Harry is working. There are definite breaks to let the reader know when there is a change in setting. It would be incredibly confusing without them. But the important thing is, we aren’t actually told that the side story is actually a teaching example he is sharing with the students. Because of this you have this effect of the two different stories working side by side and they feel completely unrelated, while remaining as moments in time of their own accord. We aren’t shown that the story was a learning experience until the moment in the lecture where he asks the students what he did wrong. As the reader you get this immediate feeling of everything tying together without actually experiencing the resolution. It’s like finding the clue that finishes the mystery without realizing what the mystery was until right then. Now, sure, I might feel a bit biased when I speak of liking this story, much as I do pretty much any of the Dresden stories. But that is only because they are some of my favorites. The parallel nature of this one struck me as something a bit different than the usual for a Dresden story. Mind you, that is also a part of how it interacts with the rest of the stories as a whole. This one was a standout not only for the different way we experience it, but also because this one shows a bit more of the effect the supernatural has on the greater world. Butcher has written a few other Dresden books that reflect a bit of the greater world. But I think this one brings it closer to the reader. Instead of touching into the lives of the characters we see as mainstays in the stories, this one zooms in on people we don’t even know. Sometimes it is a moment when our eyes are opened to the pains of others that we see the world as a much larger place than we normally consider. (Don’t hate me when I say this next bit because it might be corny) And it is when we realize that the world is much larger than we thought, that the world shrinks in a bit more around us. In that moment when the world is so huge and we take more of it in, it closes in a bit more around us because the oddities we thought we once held as our own, are shared by others. And with that, I might have gone to a weirder place than I normally do. 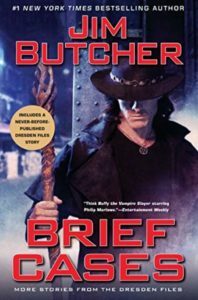 If you haven’t picked up any of the Harry Dresden books by Jim Butcher, you disappoint me. But there is still time before the next one comes out (yes, I am giving you the eye Jim). At least with the stories in Brief Cases we are given a bit of an appetizer to tide us over before the next book comes out.